Argos Analytics and Arup have collaborated to develop the WeatherShift™ family of tools to facilitate the design of a resilient and sustainable built environment. Our strategy has been to identify weather related tools used by building and infrastructure designers and modify the historical weather data they rely on to reflect future climate conditions based on an ensemble of climate projections. An overview of the tools in shown in the table below. Summary WeatherShift future weather data is freely available for 259 global cities at www.weathershift.com and sets of WeatherShift future weather files can be purchased through the Integrated Environmental Solutions website at http://www.iesve.com/support/weatherfiles/weathershift. Many of the most serious impacts of global warming are due to extreme weather events, such as heat waves and droughts. Argos Analytics uses its TRACE™ analyses, based on scanning climate projection ensembles, to estimate the likelihood and magnitude of future weather extremes. The type of event being analyzed is translated into a signature expressed in terms of the variables used by climate models. An ensemble of climate projections is then scanned to see how frequently that signature occurs in the locations of interest during the future time intervals of interest. (Technically, a probability calculated in this way is referred to as Bayesian since it is based on the best available information, in this case the climate projection ensemble, rather than on fundamental physical theory.) The instances of the signature identified in this way can also be analyzed to find the range and relative likelihood of event characteristics, including magnitude and duration. 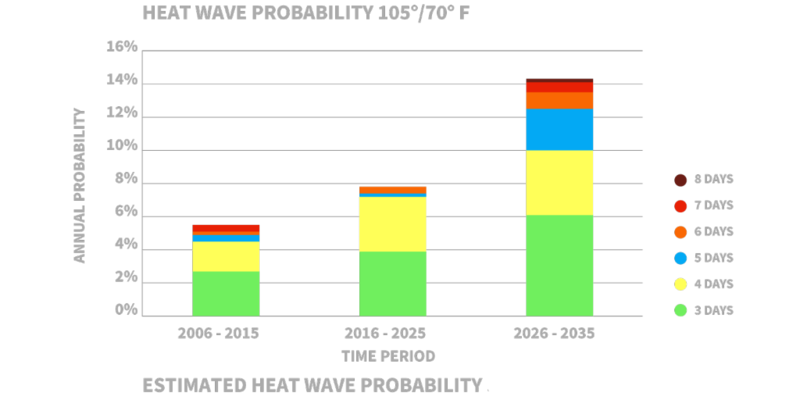 The bar chart below shows an example of a TRACE analysis of future heat waves, defined as at least three consecutive days with daytime highs over 105° F with intervening nighttime lows over 70° F, in the vicinity of Livermore, California through 2035. TRACE analyses are fast and inexpensive. Climate impact analyses using traditional methods can take months and cost tens, or even hundreds, of thousands of dollars. Argos Analytics can provide a big picture view of specified climate impacts much more quickly at considerably lower cost. The characteristics of wine grapes when harvested, and the quality of the wine made from them, are extremely sensitive to climate conditions during the growing season, especially temperature. Wine grape harvest dates are already weeks earlier than what they have been historically in many parts of the world, which means that temperatures are higher as the grapes ripen. That trend will continue and, as average temperatures continue to rise, winegrowers will need to adapt their vineyard management practices to compensate for that. In addition, when a vineyard is replanted, they will want to consider other clones, or even varieties, that are more tolerant of higher temperatures. Ultimately, some varieties will no longer be suitable in regions where they have been grown for centuries, while new wine regions farther north (farther south in the Southern Hemisphere) will blossom. 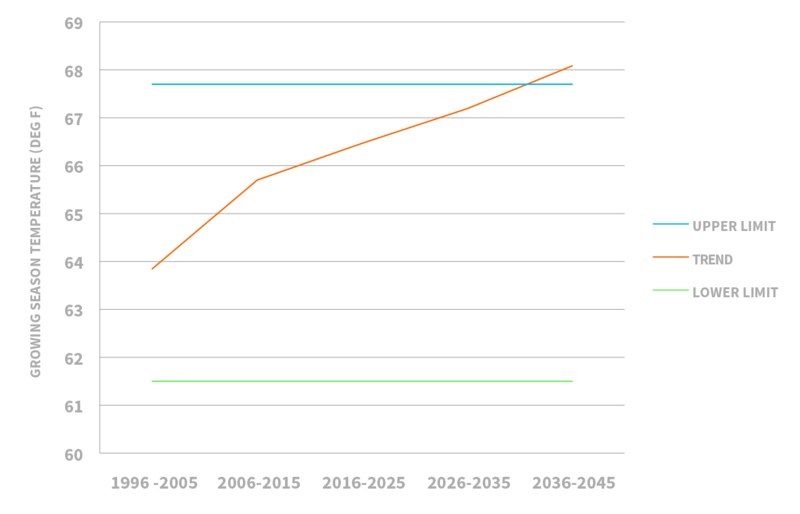 The graph below shows projected growing season temperature for a vineyard on a Napa Valley hillside relative to the lower and upper limits of the historical sweet spot for Cabernet Sauvignon, a relatively heat tolerant variety. The key takeaway is that, taking year to year variability into account, the winegrower should plan to implement adaptation measures within the next ten to fifteen years. Vineyards on the Valley floor, especially those growing more heat sensitive varieties, will likely need to take action considerably sooner. In addition to the effects of increasing average temperatures, more frequent extreme climate conditions, such as heat waves, will also present challenges for wine growers, while future changes in rainfall will be important for naturally irrigated vineyards.